New research supports theory that cancer is a ‘stem-cell disease’. Researchers have believed for a long time that cancerous stem cells may trigger reproduction and growth of cells within a cancer. These cancerous stem cells lurking within the cancer, under the radar of cancer drugs that target cell proliferation, may underlie the relapse of tumours after surgery of the primary tumour or other cancer treatments. Moreover, without the cancer, stem cells cannot metastasize, or spread. Simply put, cancer is caused by mutations to genes within a cell that lead to abnormal cell growth. Finding out what causes that genetic mutation has been the holy grail of medical science for decades. Now, researchers at the Texas A&M Health Science Center believe they may have found one of the reasons why these genes mutate and have found that it all has to do with how stem cells talk to each other. 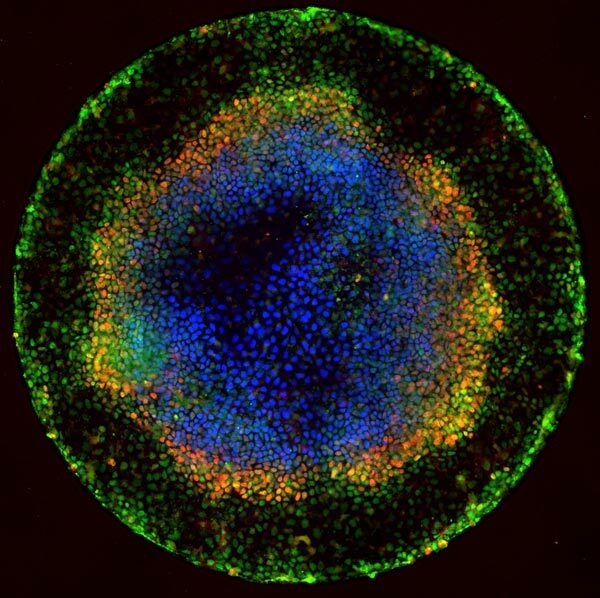 Previous studies show that stem cells have several different roles in human development. Many Americans are familiar with embryonic stem cells, which can become any cell or organ in the body; however, each organ in the body also contains non-embryonic stem cells that are specific to that organ. These organ-specific stem cells control reproduction and growth of the organ through replenishing damaged or aged cells, as well as regeneration of tissues. Some breast and prostate cancer cases have fueled the cancer stem cell theory in earlier studies. Often years after the organ or the cancerous lesions are removed and the patient is declared cancer-free, breast or prostate cancer can return in other organs, indicating the cancer had metastasized before it was originally detected. Cancerous stem cells may be the reason for this. The current study investigated a family of proteins that communicate between cells called fibroblast growth factor (FGF). This new research shows that errors in the way FGF is transmitted and received by cells can activate previously dormant stem cells in an organ, which can cause cancer. The researchers state that the results further support an existing theory that cancer is a stem cell disease. Previous studies have shown that even within the same lesion, not all cancer cells are the same. Researchers also often find cancerous stem cells within a lesion, and many believe these cells are the key to preventing the initiation and relapse of cancer. The lab explain that nearly every cell in the body expresses the FGF protein, however, there are 22 different types, so researchers have struggled to understand their role in cell communication. Until recently it has been a mystery as to how one of the 22 different types of FGF were sent out by cell expressers and taken in by cell receivers. The current study traced the life cycle of multiple generations of cells to observe the normal pathways of FGF and what happens when a miscommunication occurs. The data findings show that this research is instrumental in establishing the way FGF is normally communicated in cells. The team note that before it can be known what’s abnormal, they must first establish what is normal. They go on to add that it is particularly important to understand how FGF works in normal and cancerous stem cells. Recent research has shown that FGF appears to play a major role in breast and prostate cancer, which is why the team decided to focus on the protein’s role. The results showed the specific pathways FGF uses to activate stem cells or to keep them dormant. The researchers state that this discovery has major implications for future cancer therapies. The lab stress that if the medical community understands how to keep these cells dormant it means that although the patient may have to live with the presence of cancer stem cells, they can prevent them from causing the cancer to come back. The team go on to conclude that FGF miscommunication activates previously dormant stem cells in one organ, and proceeds to miscommunicate with other cells in the same system, enabling the cancerous stem cells to reproduce and spread, impacting other systems in the body. The researchers surmise that while the research is specific to prostate stem cells and prostate cancer, it could have implications for cancers in other organs as well. As current cancer therapies such as chemotherapy and radiation only target actively proliferating cancer cells, the group hypothesize that if they can control how cancerous stem cells remain dormant and how they are activated, they can cure cancer.